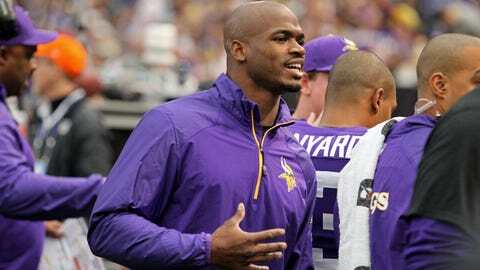 Adrian Peterson missed Sunday's game against the Eagles with a sprained foot. about missing last week’s game with a sprained foot. One game is all Peterson is likely to miss. to face the Bengals’ fifth-ranked run defense. “He’s feeling better,” coach Leslie Frazier said. yards, the most by a Vikings quarterback since Brett Favre in 2010. Thursdays. “But, no, if he’s healthy we’d like for him to get some work. injury. Tight end John Carlson passed his concussion testing and returned. since spraining his ankle on Dec. 8.